The act of experiencing nature centers on journey. This two part center and serving structure results in the visitor traveling across the site in order to understand the zones of inhabitance. Two structures sit across the ridge of the peninsular site. Connected to existing Villa through gash in land, the North Structure contains photographic darkrooms and bathrooms in the two back structures as well as image galleries, a classroom, and library in the two west facing structures. A precursor investigation to the above center studies the habits of the user, the unabashed birder. This sculpture garden is home to a variety of different types of creatures as well as flora. 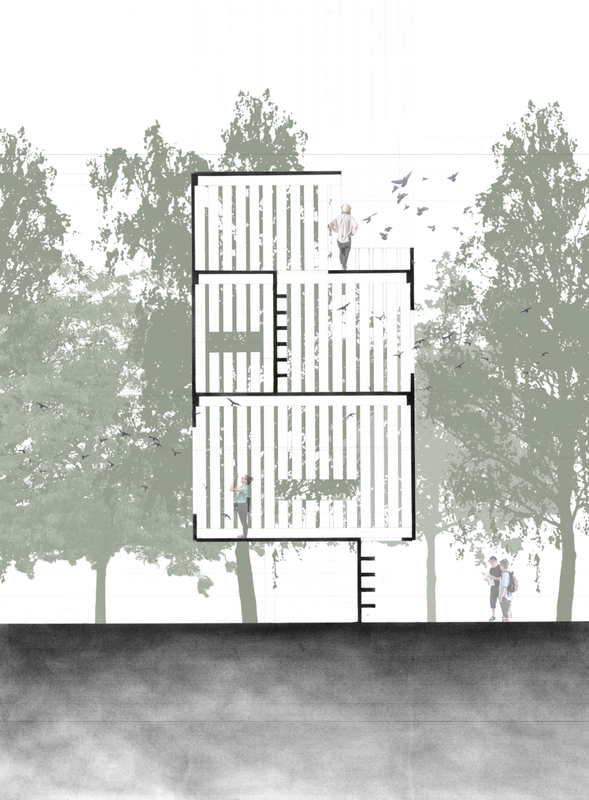 In this view focused project, these places of occupation allow the user to move through the existing trees utilizing a timber structure. The two structure's cladding directionality serves to emphasize the tree types that inhabit the two sides of the site, the ridge filled with sprawling live oaks and the floodplain filled with sixty foot pines.